R Cochran set up in Glasgow in 1856. His son, Alexander, took over on his father's death in 1869. In 1896 J Arnold Fleming joined him as a partner and the company was known as Cochran and Fleming. The Britannia mark had been used from Robert Cochran's early days, and in 1920 the firm became known as Britannia Pottery. It traded thus until 1935. The company did not make china. 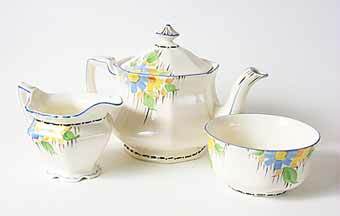 All the wares were white earthenware with either a transfer or hand painted design. Most of their wares were highly decorated and were, at their best, excellent. At their worst they could be somewhat fussy or a little kitch.